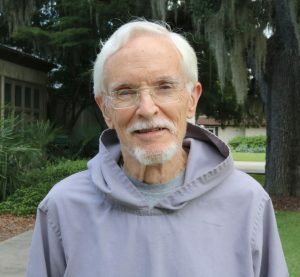 I wanted a change and I got it: from chilly, foggy San Francisco to semi-tropical South Carolina; from a community of over a hundred senior citizens, mostly women, centered on entertainment and physical exercises and seldom quiet, to a much smaller community of men centered on contemplation and religious exercises and almost always totally quiet except in prayer. I had considered myself an early riser, being up at 5:30, two hours before the rest of the community. Now I would be up almost three hours earlier than that if I expected to continue my usual physical exercises before the monastic day began. But those were the obvious changes and I expected them. The devil, they say, is in the details – and even in a monastic community, the devil is hard at work. There was, of course, the challenge of finding my way around a new community: where is the Refectory, the Library, the laundry machine, an internet connection? But more challenging was finding my way around not one Prayer Book, but five, and negotiating the tiny differences between the Mepkin liturgies and the Episcopal Book of Common Prayer. Big differences might have been easier; at least I would have known I was on unfamiliar ground. But it was the little differences that caught me time and again. Even on day thirty, I caught myself saying “O God, make haste to help us” instead of “help me.” Even when all the words were the same, the commas were in different places: not “thy kingdom come, they will be done, on earth as it is in heaven” but “thy kingdom come, thy will be done on earth, as it is in heaven.” When you’ve been doing it one way for 80-plus years, it’s not easy to remember a new pattern.